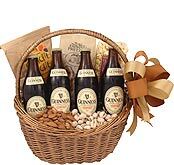 That's enough treat to trick any Guinness lover into a night of indulgence. While the heavy basket may require some care when lifting, it also shows just the right amount of care for someone special. 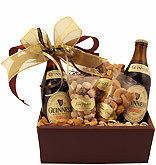 Guinness is the perfect way to show the love when you can't make a personal appearance. 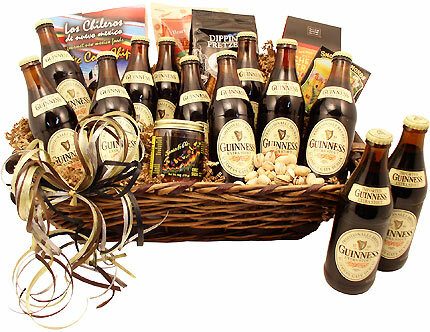 With 12 bottles of authentic brew and enough hand-selected gourmet snacks to share with a small crowd, this is also an impressive basket that will turn heads at a larger event. We sent this to friends in Florida and they love it! Said the Guinness beer is their new favorite. 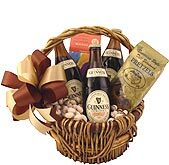 They also said the snacks were great with the beer and they enjoyed the basket with the college bowl games. We will definitely order again. Great company to do business with, had a bit of rouble with tracking it down as te recipient was away the customer service was right on target every step of the way. our frie ds loved the basket presentation was mint ! Cold beer is always good, i drink a lot of it each day. Sometimes to much and i fall down or get locked out of the house or drive poorly. I bought two of these for Christmas gifts and they were a hit. Very nicely packaged and Worth the price. MY BROTHER WAS VERY PLEASED WITH HIS CHRISTMAS GIFT! QUALITY AND FAST SERVICE. THANK YOU! These guys are great! Gift was shipped right away and was packaged beautiful. It was given as a retirement gift. The recipient was well pleased. Great gift idea for the "man's man" who deserves something unique!